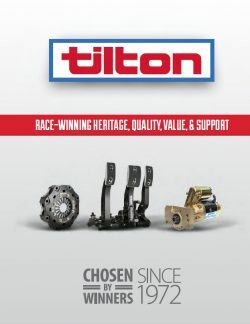 Tilton’s 6000-Series hydraulic release bearing was recently featured on Two Guys Garage! Kevin Byrd demonstrates on of the key features of the HRB: its adjustable height, which makes it suitable for a variety of applications. Jaysen Baker uses a 76-Series master cylinder for his Cadillac CTS-V-compatible design. Adam Auerbach’s GMC Syclone Hillclimber runs a Tilton 600-series pedal assembly, standard remote brake bias adjuster and XLT-Series Super Starter. “Miriam Macmillan sets a new class record of 220.258 mph in her turbo K15 CRX on the long course at Bonneville in August 2011.” Miriam set her record using a Tilton Honda K-Series Cerametallic clutch.